Cleaning car battery connections can save getting stranded at the side of the road. The Fix-It Club is moving into your garage with a new category on Car Repairs. In these Fix-It Guides you’ll get step-by-step instructions on how to maintain your car. You’ll discover how easy it is to change the oil and filter, and how to perform many other basic service procedures. You can start with simple weekly maintenance while you’re waiting for the gas tank to fill up. This simple procedure can save you from being stranded at the side of the road — or in the clutches of Dishonest John’s Auto Shop. And you won’t even have to get your hands dirty. If you’re hesitant to step into the world of auto maintenance, you’re not alone. But fear not! My mechanic and I will be with you every step of the way—and we brought my digital camera to show you what everything looks like. Let the fun begin! Where to start? How can you start the habit of car care without planning your life around it? The best place start, in my opinion, is car maintenance at the gas pump. You have to buy gas, right? And you have to stand there while the tank fills up, right? So why not make those few minutes productive and go through some easy-to-remember steps that can make a difference between an expensive repair and a drive-forever car? It really can be that easy to start your car care habit. In fact, that’s what this section is all about. Maybe you’ll decide to hire someone else to change the car’s oil and tackle other tasks, but if you can get into the habit of checking it every time you fill it up, your car can live longer—and make your life a little easier. Doing your own “maintenance” at the gas pump prepares you for the next step: driveway maintenance. Even if you’ve never popped the hood on a car you now can make a habit of car care with just a few minutes. Check under the hood. This section offers easy care steps that you can tackle about once a month to keep your car on the road longer. They are basic, but important tasks that will take you just a few minutes. About the only tool you’ll need is a shop rag or old washcloth to keep your hands clean. If you prefer, you can also wear surgical gloves to ensure that oil and gunk won’t ruin your manicure. All of these checks are done at the front of your car, so pop the hood and let’s get started. As you’ve seen, oil is the life-blood of your car’s engine — and the engine is a pretty important part of your car. So making sure that the oil is doing its job is a vital part of maintenance. Here’s where you can save some time, money, and potential repairs with an investment of less than 30 bucks about four times a year. This section offers step-by-step instructions for the most popular do-it-yourself car care job: how to change the oil and filter. It includes info on exactly what parts and tools you’ll need to do the job in less than an hour. Once you get some experience you can cut that time in half. And you’ll know the job is done by someone who cares about your car, rather than by a minimum-wage daydreamer who may forget to put on the new filter. Most tire and car manufacturers recommend that you rotate tires every 7,500 miles. Why? Because tires don’t wear evenly. Even properly inflated tires wear differently in different locations on the car. Front tires get wear from turns that back tires don’t get. Here’s how to rotate tires on your car for longer wear. The best time to inspect your car’s brake system is once you’ve done all the work of supporting the car and removing the wheel. At that point, a brake inspection takes just a minute or two at each wheel. Here are the steps to take to inspect brakes on your car and make sure they are safe. Before reinstalling wheels and tires you also can inspect suspension, the major steering and suspension components, on your car in a matter of minutes. The steering system turns your car. Suspension is the system that helps smooth out bumps in the road. Most of these components are located behind the wheels so take a few minutes now to familiarize yourself with them and check their condition. About once a month you check the coolant level in your car. Once a year, while you’re doing that job you can perform a closer inspection to check the cooling system and make some adjustments. Your car’s cooling system uses a water pump (or, more correctly, a coolant pump) to circulate a mixture of antifreeze and water through the engine to reduce heat build-up. Aluminum engines don’t need as much coolant to keep them in a safe temperature range as older iron engines. During a year, your car may pull in 7,000 to 10,000 gallons of air to be mixed with gasoline as the engine’s fuel. You certainly don’t want dust and bugs inside your engine where they can cause problems. So your car has an air filter. Early cars didn’t have air filters and later ones were relatively crude. However, today’s major-brand air filters are efficient and require no maintenance other than periodic replacement. Here’s how to easily replace the air filter on your car. Spark plugs are a vital component of your car’s gasoline engine (diesel engines use glow plugs). The car manufacturer will recommend how often spark plugs in your car need to be replaced. It’s in the owner’s manual. Here’s how to replace spark plugs in most gas engines for cars and even lawn mowers. Accessory belts apply the engine’s rotation to turn other components. Depending on the design of your car, these belts may be used to power a coolant pump and fan, an alternator, a power steering unit, or air conditioner compressor. Here’s how to adjust or replace engine belts on your car. One of the most important car maintenance job is making sure that the engine has enough coolant to keep the engine running cool for many miles. Coolant, like everything else on a car, wears out with use and time. So it makes sense to replace coolant periodically. Many car manufacturers recommend coolant be replaced with new stuff about every two years or 30,000 miles. Here are simple instruction on how to replace engine coolant. If you’re a die-hard do-it-yourselfer, get your car’s service manual out and follow instructions for replacing automatic transmission fluid and filter. Draining and replacing automatic transmission fluid isn’t that tough of a job, but replacing the filter can be on some cars. Here are the basic steps to replace transmission fluid. What can go wrong on a car? Just about anything! Entire engines have been known to drop out of a car while driving! Fortunately, it happens so infrequently (with lots of warning signs) that car owners don’t need to worry about it. However, there are many other problems that can ruin a vacation—or a trip to the store. Here’s how the Fix-It Club can help you troubleshoot car problems. The Fix-It Club can help you understand and diagnose common engine repairs include disassembling, replacing or repairing, and reinstalling primary parts such as pistons, connecting rods, crankshaft, camshaft, valves, and related parts. Here is some basic information on car engine repair. Like engines, manual and automatic transmissions are typically replaced rather than repaired if the problem is big. Fortunately, there are tests you can perform on automatic transmissions. In addition, there are linkage adjustments for manual and automatic transmissions to make things better. Here’s how the Fix-It Club performs a car transmission repair. Repairs to the engine’s cooling system typically mean replacing the coolant pump, the thermostat, and/or the radiator. The Fix-It Club offers basic instructions on how to perform these three important jobs of cooling system repair. The Fix-It Club includes many free car repair Fix-It Guides. One of the most popular do-it-yourself car repair jobs is brake repair. Brake repair means replacing components that have failed or are about to fail. Here’s how to perform a car brake repair. The weakest link in an electrical chain is the fuse. That’s by design. If a circuit gets too much power, you want the fuse to blow rather than the radio, computer, or other gadget. That make’s sense. Also it makes sense to first check the car’s fuse system when something electrical that should work quits. Here’s how to check and replace car fuses. Your car’s battery is a storage container that gathers electrical power (produced by the engine) and stores it for use by lights, motors, relays, and other gadgets. So it’s important that the battery hold the charge. 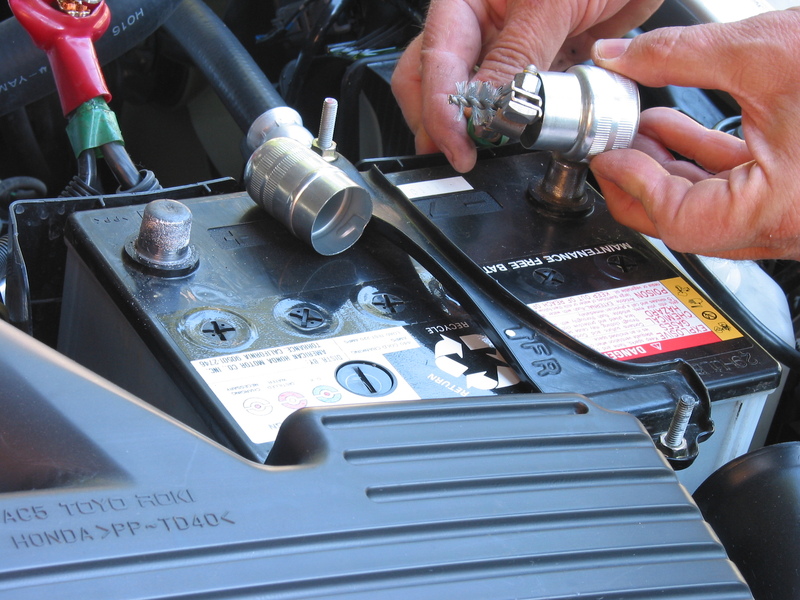 Here’s how to replace a car battery. A critical electrical component that can be replaced by a handy do-it-yourselfer is the car alternator. A car alternator converts some of the engine’s power into electric power for storage in the battery. If your car’s battery is in good condition and can hold a charge, but doesn’t, the alternator may not be doing its job. Here’s how to replace a car alternator. There’s much your car’s computer can tell you about your car’s condition — if you know how to test and read it. Here’s how to perform car computer diagnostics. You’ll need to buy or borrow an Onboard Diagnostics (OBD) device. Car radios and sound systems, too, are complex electronic devices. So most repairs mean replacement. However, before you start ripping up the dashboard, here are some things you can do to begin car sound system repair. The Fix-It Club moves into your garage to help with common car repairs. This Fix-It Guide shows you how to clean car upholstery. What with shuttling around kids and pets and other treasures, your car’s upholstery will eventually become stained. It may be grape juice or crayon or special sauce or. . .uh, never mind. Here’s how to clean car upholstery. Today’s cars are build differently from their fathers and grandfathers. Older cars used thick metal body components (doors, fenders, bumpers) to minimize damage from impact. Today’s cars are built with a sturdy frame (called unibody construction) onto which body panels are hung for decoration. Today’s cars are actually safer in the event of an accident, but these body panels don’t take much abuse. Here are basic instructions on body panel repair. The Fix-It Club know how to perform many car repairs, including touch-up painting. The process is easy and most people can do it — if they follow a few basic steps. Here’s how to perform touch-up painting on your car. The Fix-It Club can help you perform basic car repairs. One of the most common is car window chip repair. Small stones and other debris traveling at 65 miles an hour can chip your car’s windshield. Fortunately, the safety glass used in modern car windows can withstand the shock without shattering. Here’s how to perform a simple windshield chip repair. If you need to replace a door window or motor, repair door damage, or fix a door handle or lock, you may need to remove a door panel – the interior covering of a car’s door. Here are the steps to car door panel removal.